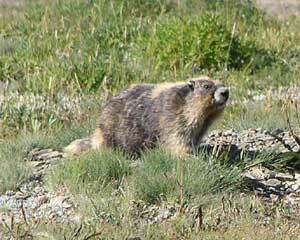 The marmots are out in force. These are just two of the critters we saw out near Obstruction Point. We think the one on the right is a juvenile. He (or she) was sure playful. If you do plan to get out to Obstruction Point, do so soon. It often gets snowed in by late September, and it is an amazing place. 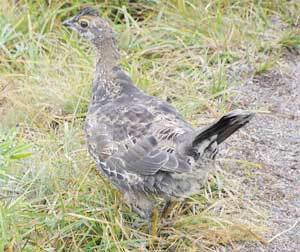 The blue grouse are all over Hurricane Hill lately. If you want to tell the boys from the girls, check out the lady on the left and the lad on the right. He's the one with the golden eye and yellow feet. The best spotting is towards the final third of the ascent with its "hanging gardens". There are just a few flowers left, but the high mountain foliage is starting to turn, and the grasses are in seed. 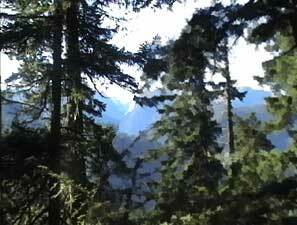 Bring a rain coat in case a cloud drifts by, but it is not too late to enjoy the high country. Check out these little green apples. You can't buy them in any store. They're tart and dry and perfect for a pie. You have to add water to them to make applesauce. They might not look like much, but they are intensely flavored. Washington State may be famous for its apples, but let's face it, the "Delicious" apple is delicious in name only. It usually tastes like sugar and cardboard. Even Washington State farmers are now starting to pull out their Delicious orchards and putting in other varieties. Our default supermarket apple is the Granny Smith, but even these can be more sweet than tart. When we lived in Massachusetts, we'd often try out other cultivars. 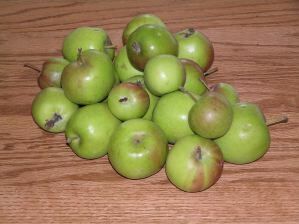 Even Stop and Shop had a fairly good "apple festival" with a good dozen types to choose from. Baldwins and Northern Spies weren't too bad, but our favorites were the Gravensteins. There was an orchard in Littleton that had Gravensteins. Out here in Washington, we actually found some Gravensteins at the Port Angeles Farmer's Market. They were pretty good, and we'll be looking for them again this season. Still, even Gravensteins pale in comparison with these feral green monsters. Where do we find them? That would be telling, but they are on legally accessible land and not so far away that we couldn't carry back a pie or two's worth. Great Apples: Born to be wild and be green. 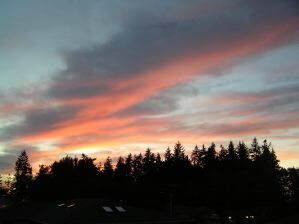 Wow, we had a great sunset last night. It isn't a patch on the New England autumn sunsets that are wonders of the world, but it was pretty impressive for the northwest. We were up at Hurricane Ridge today. The temperature was in the 80s, but the air was dry. Most of the flowers have passed. There was one bunch of lupines, but the rest were harebells, yarrow and a few other late season bloomers. 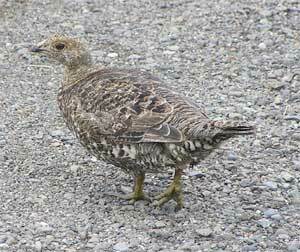 We did see a number of blue grouse (or is it grice)? 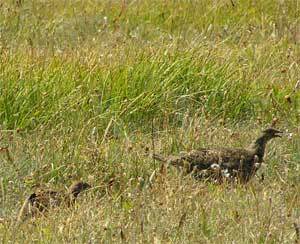 We even got a picture of a grouse and chick. You have to look carefully to spot them. They hide easily in the grass. 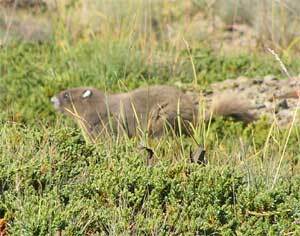 We thought we had seen a marmot, but it was just an ochre rock. As for the snow. There is still a bit, sort of southwest of the Hurricane Hill summit. Don't expect to do much skiing. The hike is still well worth taking. The plants are still green and loaded with seed pods including the white fluffy ones, the pea pods on the lupines, and the brown prickly ones. Last week we took a walk on the Dungeness Spit which is an unusual sand formation jutting out from the North Olympic Peninsula into the Strait of San Juan de Fuca. It is basically a sandbar shaped by the prevailing current from the west meeting the silty flow of the Dungeness River. The hike is about five miles each way, from the parking lot to the lighthouse and back, 4.5 miles of which are along the sand bar. You often see seals, cormorants, loons, and other wildlife, along with the sea traffic along the strait. There are excellent views of the Olympic Mountains and Vancouver Island, and a great sense of isolation being both so close to short and so cut off from it and surrounded almost completely by water. On a cloudy day, the driftwood forest and the sky seem to be the same color. We tend to try and walk close to the water, so we can smell the sea and watch for washed up kelp and shells. The footing is also better closer to the see, since the wet sand holds one's weight better, and sand is easier to walk on than the lumpy, polished rocks that are deposited by the tide. 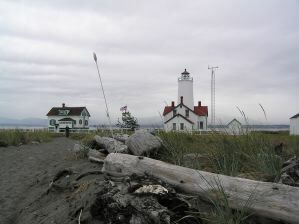 The less determined hikers drop out by the one mile marker, which is next to the remains of a beached dinghy perched with the driftwood well above the sea. The bluffs vanish behind one as the spit curves between mile posts two and three. Then come the sandy tide pools stranded by the sand bars. By mile four, you often find a pod of seals who seem to hang around out towards the lighthouse. It rained on our last trip, but the real challenges are the rocks and sand. You can wear a raincoat and broad brimmed hat, but the trick is to find the right low tide. Since our last trip, we've put together a little driver for finding tides using the XTide program. It is a really dinky little program, and in retrospect it seems kind of obvious. You might want to check it out before your next littoral adventure.